Releasable labels are printed in up to three colors on our standard polyester flexographic face stock, and laminated with a proprietary laminate to allow the application and easy removal of shipping and/or other informational container labels. The releasable label allows for repeated application and removal of labels to its face without the need for cleaning adhesive residue. Our polyester face stock has a proprietary adhesive backing to allow for strong adhesion and durability in a variety of environments. Releasable labels can be personalized with your information and/or logo, and produced in any number of existing sizes. Otherwise, a custom die may be produced for sizes that meet your specific needs. Releasable labels are often used for returnable packaging, pallets, totes, dunnage, agricultural, warehouse racks, or wherever you have a need. Releasable labels can be applied to most clean surfaces including plastics, metals, and glass. Many of Plasti-Fab’s clients utilize these releasable labels in their warehouses, distribution, and material handling centers. 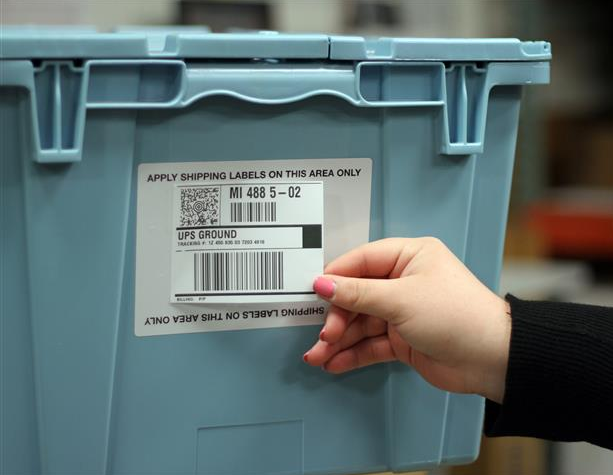 Using these types of releasable labels allows companies with large inventory lists to reuse their containers to reduce costs and improve the organization of their products. This is a cost-effective solution that can help improve your overall productivity.